Home :: Books :: Father Finn, S.J. 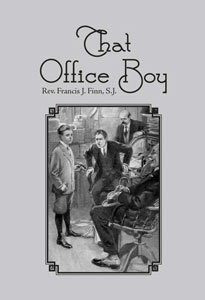 :: That Office Boy by Father Francis Finn, S.J. Michael Desmond reads the morning paper and is drawn into a series of adventures and undreamed-of complications, incessant work, and trilling excitement for a contest to win a Grand Piano for the Young Ladies’ Sodality of St. Xavier. It turns out to be much more than he bargained for! 213 page book, originally published by Benziger Bros in 1915.